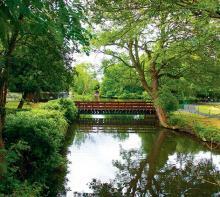 Elmore Park is located just a short distance from the Rugeley Town Centre. This small town park has a number of features with a fenced play area, grass landscaped areas, formal annual bedding display, skateboard facilities [with larger facilities for "Skateboarders"] in the adjacent Hagley Fields site, the site also contains the very popular pets corner. The site is dominated by the pool in the centre of the park, its "Horseshoe" shaped island and the mix of newly planted trees and mature trees offering a landscape feature to the local community and vistors to the site. The park is constrained by the private properties and roads on Crossley Stone, Elmore Lane and the main Western Springs Road [A51] on the remaining boundary. There are access gates in to the park loacted on Crossley Stone and Elmore Road with the remaining gates accessed of the Western Springs Road. The components of the site are Park 1.405 hec. Lake 0,5578 hec and the island is 0.0842 hec. The Pets Corner on the site is extremely popular with the community and vistors to the park, it has four seperated sections, in section one we have chickens, section two has Guinea Pigs Canaries, Zebra and Bengalese Finches, in section three there are Budgies and Quails and in the last section we have Rabbits and Guinea pigs. The lake is feed by the Rising Brook stream, this stream has its origins at Brindley Heath and follows the glacial valley through the middle of Cannock Chase to emerge at Hagley Playing Fields where it is culverted beneath the Western Springs Road to emerge in to the park. The water exit's the lake in the park via a small weir and sluice gate near Elmore Lane enterance, from here its culverted underground all the way through the centre of the town of Rugeley. Fishing is not permitted in the lake, as there are a helathy population of the native White Clawed Crayfish which is nationally protectedspecies, the following species of fish have been identified in the lake i.e. Brown Trout, Common Carp, Eel, Gudgeon, Perch and Pike along with our resident Terapins. Feeding the ducks and birds on the lake espeacillay for young children makes for a pleasent visit to the park, unfortunatly not processed bread is not the idea or correct food or natural and for the birds its not a helathy diet in large amounts. The above leaflet offers information on the Elmore Tree Trail a mix of 18 diffrent species of trees making the park a mini-arbouetum for the area. Elmore Park was awarded the prestigious Green Flag Award for quality parks in 2010, 2011, 2012,2013, 2014 , 2015, 2016, 2017 and again in 2018.